This common name refers to only one class. These are pretty much always called Insects. Nearly a million species of insects have been described by entomologists. 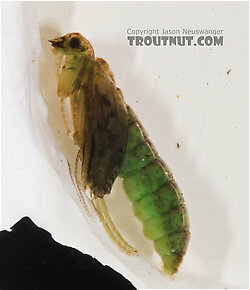 I have left several of them off of this site, just to save time, but I've tried to include all the main aquatic insects trout eat in North America. This site focuses on aquatic insects, of which the most important are mayflies (Ephemeroptera) and caddisflies (Trichoptera). Stoneflies (Plecoptera) come in third, a position arguably challenged by the many two-winged true flies of the Diptera order, which includes midges and craneflies. I've also included some terrestrial (Terrestrial: Insects which live on land and are fed on by trout only when they incidentally fall into the water are known as "terrestrials" to fly anglers, and they're very important in late summer.) 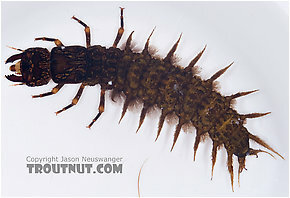 insects which I've found on or near trout streams. Terrestrials (Terrestrial: Insects which live on land and are fed on by trout only when they incidentally fall into the water are known as "terrestrials" to fly anglers, and they're very important in late summer.) like ants, beetles, and grasshoppers are an important food source for trout in many places, especially during the summer months. Aquatic insects do not live their entire lives in the water. 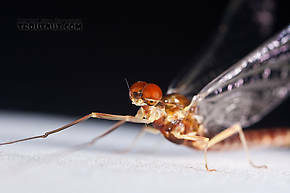 Instead, they grow for a year (give or take quite a bit) as nymphs or larvae underwater, and then they emerge into air-breathing winged insects for a short while to mate and die. There are many variations on this theme. 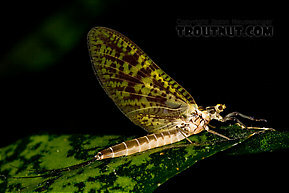 The most important aquatic insects for fly fishermen are mayflies, stoneflies, caddisflies, and midges. 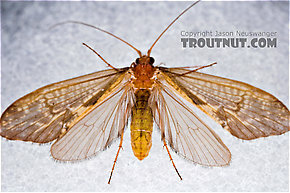 Mayflies and caddisflies are the most discussed by angler-entomologists, because it's so useful to closely identify them. The behavior of their species guides the behavior of feeding trout, and an angler who understands the lifecycle of a particular species has the upper hand when it's hatching. 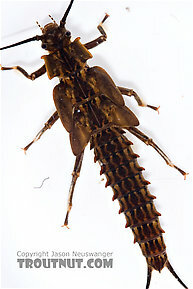 This is not so important for stoneflies and midges, because their hatching behavior is less variable. Male Ephemerella aurivillii Mayfly Spinner View 15 PicturesThis spinner molted from a dun after being photographed, and the dun form is listed here as a separate specimen. I've rarely found a more cooperative and photogenic mayfly. Rhyacophila (Green Sedges) Caddisfly Pupa View 11 PicturesI collected this pupa and several like it from the same stream and on the same day as this larva. I suspect they're the same species. Every pupa I collected was in a brown casing like the one shown in one of the pictures below. I cut this pupa out of its case after a picture so you can see more details. It is close to but not fully developed. Terrestrial: Insects which live on land and are fed on by trout only when they incidentally fall into the water are known as "terrestrials" to fly anglers, and they're very important in late summer.